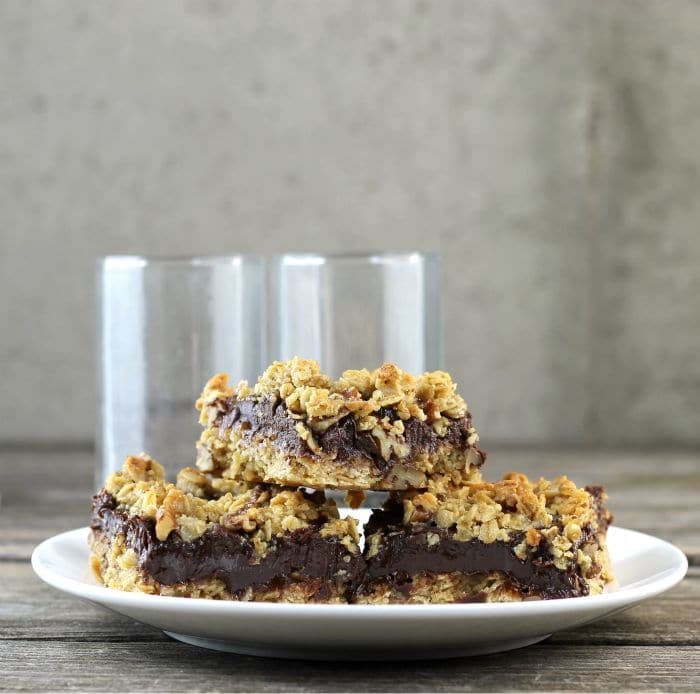 Oatmeal Chocolate Fudge Bars, creamy chocolate fudge sandwiched between layers of old fashion oats, nuts, brown sugar, along with a few other ingredients. Oatmeal chocolate fudge bars, the chocolate fudge center is made with sweetened condensed milk, butter, and semi-sweet chocolate chips. I have always had a soft spot for oats and chocolate. These bars are simple to make and would be great for any summer gathering that comes along. The chocolate fudge is simply delicious and easy to make. There are only 3 ingredients in the chocolate part. Semi-sweet chocolate chips, butter, and sweetened condensed milk. The stuff turns out to be some of the best chocolate fudge you could imagine. Cream together the butter, sugar, and brown sugar. Add the eggs and mix until well combined. Mix in the old fashion oats; after they are mixed in, mix in the pecans. Reserve 2 cups of the oat mixture for the topping. To the rest of the oat mixture add the flour and mix in. Pat the rest of the mixture into a greased 9 by 13-inch pan. Bake in a 350 F degree oven for 10 minutes. While the crust is baking make the chocolate fudge. Combine the chocolate chips, sweetened condensed milk, and butter, melt over medium-low heat until melted. Pour the chocolate fudge over the baked crust and then sprinkle the rest of the oat mixture over top. Return the bars to the oven and continue to bake 23 to 25 more minutes. Cream together the brown sugar, sugar, and butter. Add the eggs and mix until well mixed. Fold in the old fashion oats. Once the oats are combined mix in the pecans. Reserve 2 cups of the oats mixture and set aside. Add the flour to the remaining oat mixture and mix in until the flour is mixed in all of the way. Pat the remaining oat mixture into the prepared pan. Place in the preheated oven and bake for 10 minutes. While the crust is baking make the chocolate fudge filling. 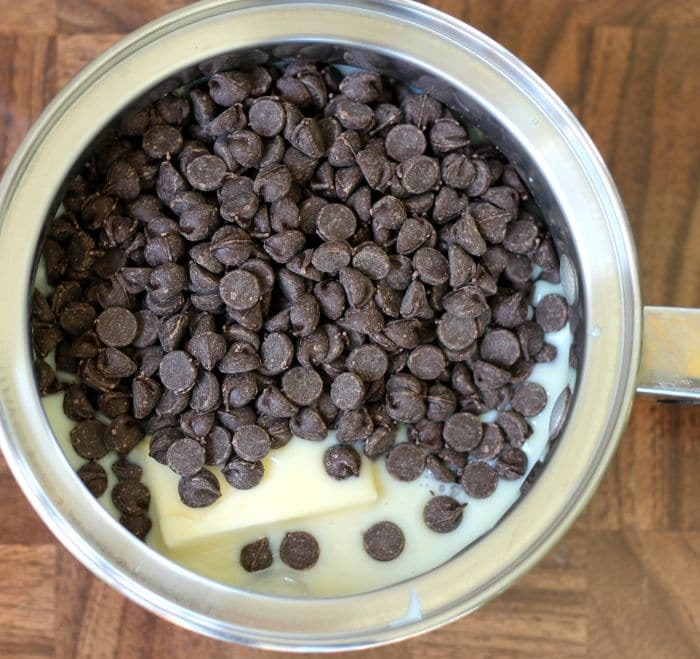 Combine the chocolate chips, sweetened condensed milk, and butter. Melt over medium-low heat, stirring often until the mixture is melted. Once the crust has baked 10 minutes remove from the oven and spread the chocolate fudge over top. Sprinkle the remain oat mixture over top of the chocolate fudge. Place back into the oven and continue to bake for 23 to 25 minutes or until the bars are set and the oats are lightly browned. 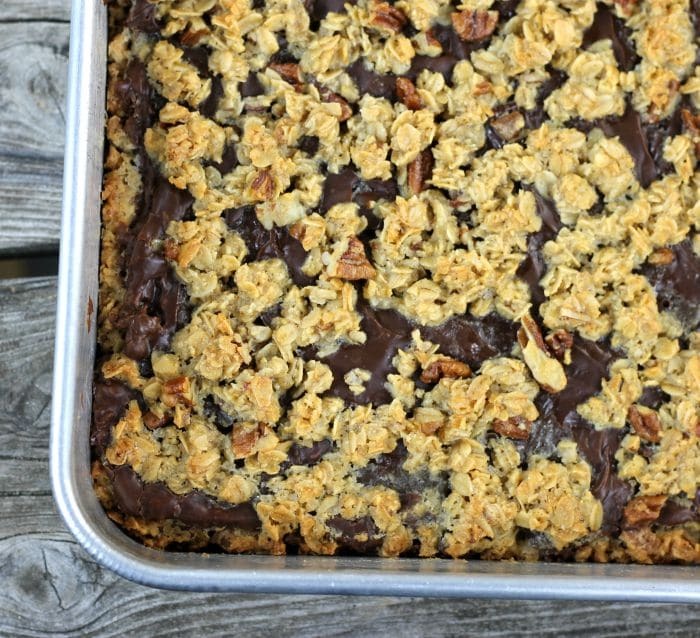 Gooey fudgy chocolate layer sandwiched between crunchy oaty layers….heavenly! I don’t typically bake sweets, most because I’d eat them all, but these are certainly tempting! 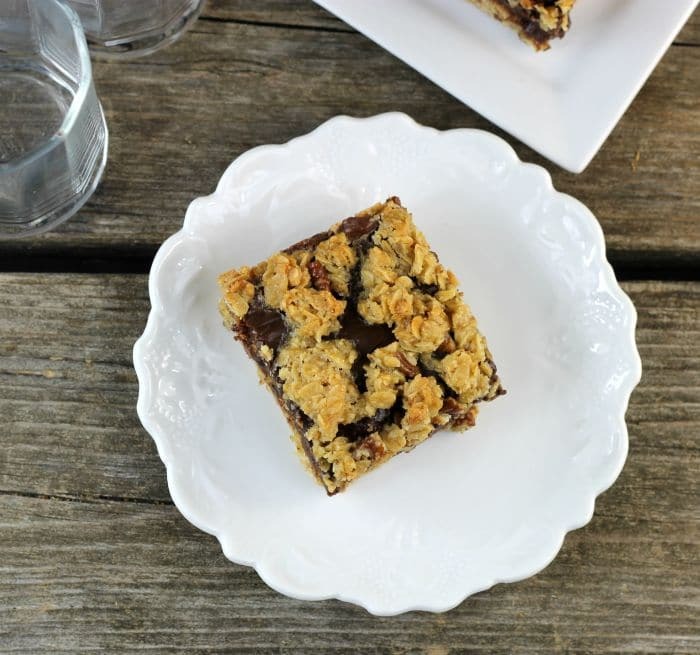 Oats make really good cookies and bars. And you’re right — chocolate combines so well with oats. These look terrific — thanks. Oh yum — these bars look so good! I love the combination of chocolate + oats in baked goods. They look really delicious, and would be a hit here with the chocolate lovers. I love bars and cookies with oatmeal in them, yum! Thanks for the recipe!